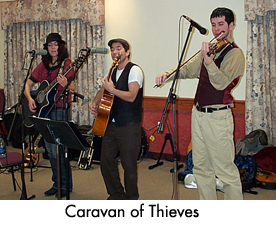 Above left: Carrie and Fuzz SanGiovanni and violinist Ben Dean of Caravan Of Thieves. 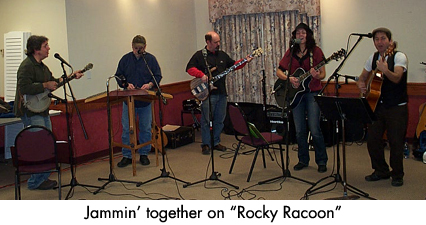 Above right: Jeff McHugh, Mike Kachuba, Geoff Kooris, Myra Healy, and Colin Healy of The Ash Creek String Band. Left: Both bands jam together.